Sweet potato brownies paleo, gluten free, grain free and sugar free. A delicious clean eating coconut flour dessert recipe with the most amazing fudgy chocolate texture and only 44 calories per slice and 2.4 g net carbs. I am all into avocado in dessert right now ! It is such a great way to add healthy fat to dessert! And nothing can beat that feeling to see my kids enjoying a sweet treat while adding some vegetable to their diet. Emma absolutely loves the chocolate avocado cookies I made last week. I thought I should try something new with even more vegetable in it. I know sweet potatoes are not low carb but if you are using my favorite sugar free flavored maple syrup those sweet potato brownies contains only 2.4 g net carbs per square. Amazing right ! ? Sweet potato puree – I used orange sweet potatoes, you can simply prick the sweet potato with a fork and microwave for 6-8 minutes until tender and then scoop out the flesh to have about 1/2 cup sweet potato puree. You can bake them too, but it took longer about 35-40 minutes. Liquid syrup – maple syrup, agave, brown rice syrup anything will work BUT to make mine sugar free I am using natural maple flavored sugar-free syrup made of monk fruit. It is 100% low carb, sugar free and low calories. Eggs – or vegan option ! 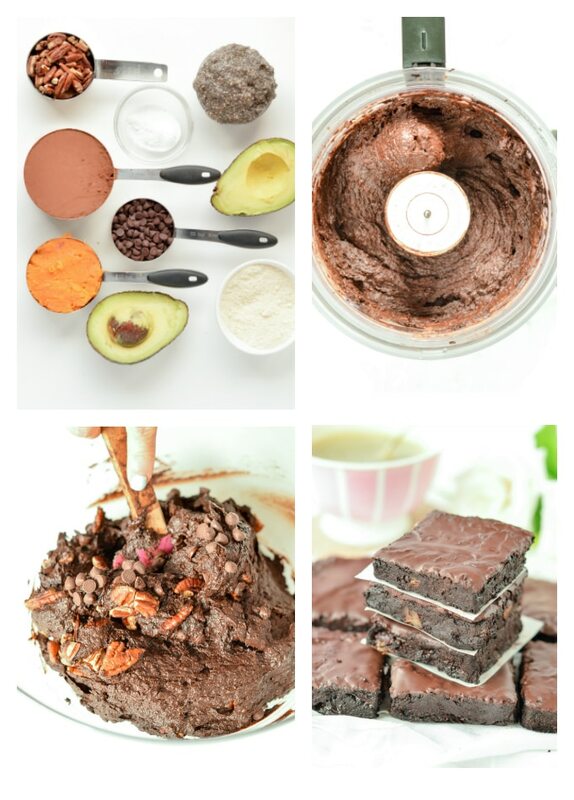 as hubby is vegan I tested this sweet potato brownies paleo recipe with chia gel as well. Both works ! but if you use chia gel see recipe note below. The batter is a bit drier and you must add 1/2 cup dairy free milk to your recipe to make it work. 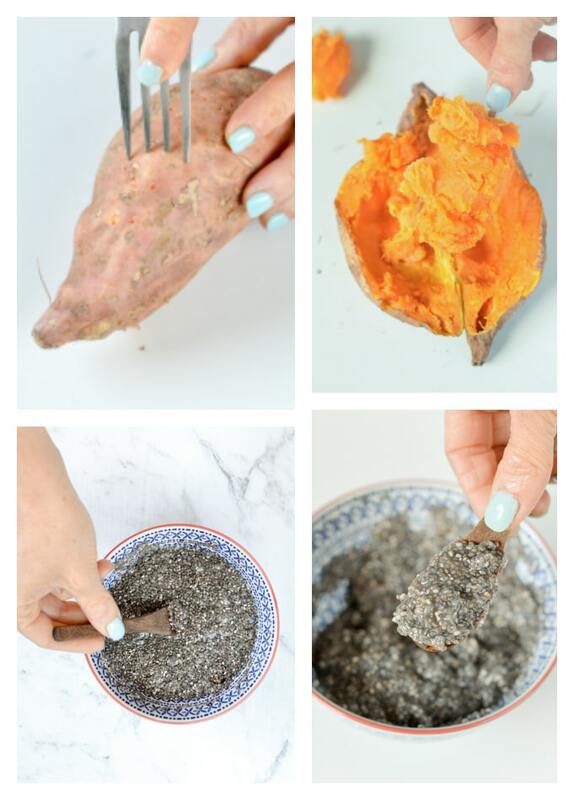 See below how to make chia egg. All you need to make those lovely sweet potato brownies is a food processor and few minutes to brings all the ingredients together. It is optional but I recommend to transfer the batter in a mixing bowl to add dark chocolate chips and chopped pecan nuts into the batter. It take few extra minutes but this extra steps brings this brownie to the next level. It is BOMB! You won’t regret it ! 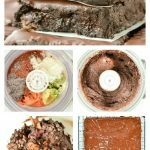 The MOST fudgy brownie and low calories! I am pretty sure it is the combo of sweet potatoes and avocado that makes this brownies so fudgy and moist. 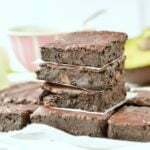 So be ready for dark chocolate teeth and sticky fingers cause those are the most decadent fudgy brownies you will ever had. Yes that is another great news a square only contain 44 calories and 2.4 g net carbs. I know that sweet potatoes are not low carb but considering the small amount used in this recipe the carbs per serve is very low. 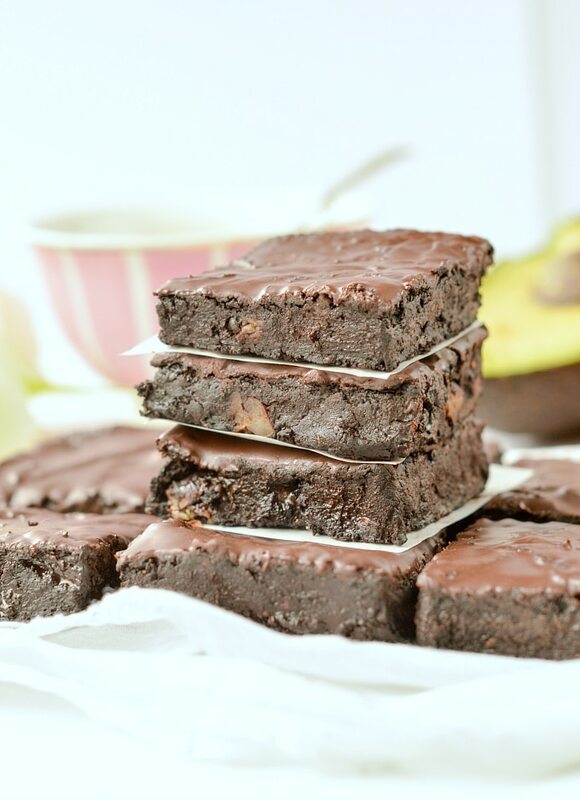 If you really watch the carbs, try my sugar free fudgy avocado brownies recipe instead. 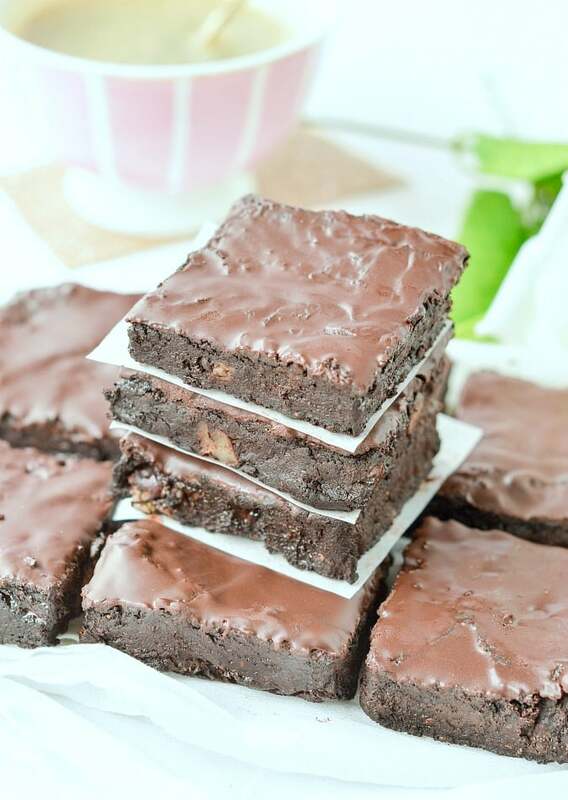 It is clearly the best brownie recipe to enjoy if you are on a diet. All my family ask for more and loves this. I hope you will enjoy it too! WATCH THE SWEET POTATO BROWNIES RECIPE VIDEO AND MAKE THEM NOW ! Sweet potato brownies paleo, gluten free, grain free and sugar free. A delicious clean eating coconut flour recipe with the most amazing fudgy chocolate texture and only 44 calories per slice and 2.4 g net carbs. Prick the sweet potato with a fork (keep skin on). Place on a microwave safe plate and microwave for 5-6 minutes or until the sweet potato is entirely soft and you can easily insert a knife through it. You can also bake your sweet potato at 350F for 35-40 minutes. Cut lengthwise - be careful it is very hot - cool down for 10/15 minutes then scoop out the sweet potato flesh. Set aside in a bowl. You need 1/2 cup sweet potato flesh/puree. In your food processor with the S blade attachment add all the ingredients except the optional ingredients. Process for 30 seconds to 1 minute on medium speed until all the ingredients comes together and you obtain a shiny smooth batter. Pour the brownie batter into a large mixing bowl and stir in chocolate chips and chopped pecan nuts, if used. Transfer batter into the prepared square pan. Spread the batter evenly in the pan using a spatula. Bake for 20-25 minutes or until the top and sides are set. Cool down 10 minutes in the pan before pulling out the brownie from the pan using the parchment paper to pull out the brownie easily. Transfer the brownie on a cookie rack to cool down to room temperature before decorating. Melt your dark chocolate (use your favorite one anything >70% cocoa is an healthy option) in a small mixing bowl. I microwave mine by 30 seconds burst, stir and repeat until fully melted and shiny. Spread evenly on top of the brownie with a spatula. Freeze 10 minutes to set the chocolate frosting quickly. Freezing also add an extra fudgy texture to the brownie! 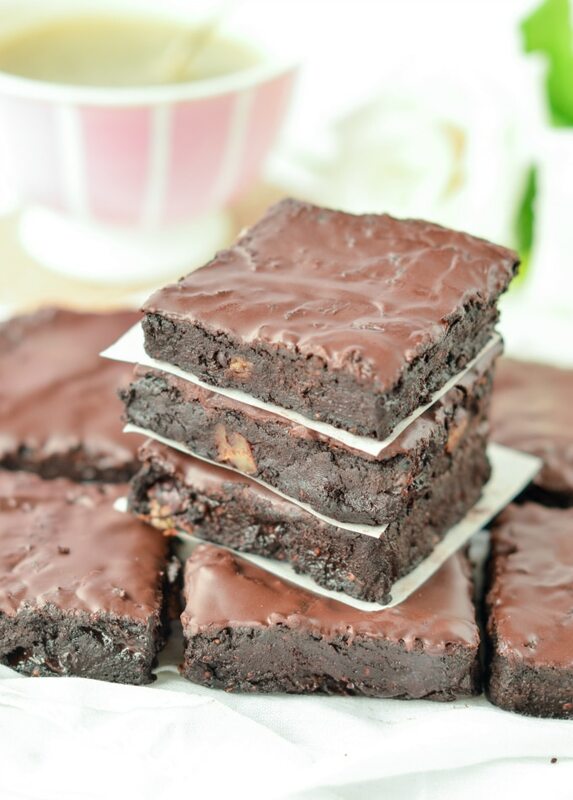 Cut into 16 brownie squares and enjoy. Vegan option: replace the 2 eggs by chia gel and an extra 1/2 cup almond milk -this is necessary or the batter is too dry with you only use chia gel. For the chia gel, stir 2 tablespoons of chia seeds into 6 tablespoons of water. Set aside 15 minutes until it forms a gel. Add in the recipe instead of eggs with an extra 1/2 cup of almond milk. Storage: I don't recommend to freeze this recipe. However, it stores very well for 4 days in an airtight container in the fridge. The brownie is even more fudgy when stored in the fridge. This sweet potato brownies paleo recipe makes 16 brownies squares. Nutrition panel is for one square using natural sugar free maple syrup. Thank you for sharing so many of your delicious recipes!! You’re welcome, it is a passion to create healthy low carb recipes and share them with others. Enjoy the blog recipes and thank you for trying some of them from your kitchen. XOXO Carine. Feel free to use any milk your friends can eat, it will work well! XOXO Carine. Sure! Any milk actually work like coconut milk, oat milk, rice milk or hemp milk! Enjoy the brownies. XOXO Carine. Well, I do freeze plenty of my food as well and I am not saying you can’t freeze this particular brownie recipe. I simply don’t recommend it as I found the texture very different after freezing and not as good. But it stores really well in the fridge for days ! Enjoy the blog recipes, XOXO Carine.